The church is responsible for a litany of injustices — and today Christian rhetoric is used to defend a violent neoliberal capitalism. But the glorious tradition of liberation theology can't be forgotten. The fiftieth anniversary of 1968 has occasioned much reflection on that pivotal moment in the twentieth century. If the quintessential image of that year of upheaval is students assembling barricades in the Paris streets, or protests at Berkeley against the Vietnam War, it was also marked by challenges to political and social power throughout the world. Curiously overlooked, however, is the gathering in Colombia of the Medellín Conference of Latin American Bishops — a pivotal event in the development of liberation theology throughout Latin America. The declarations of the conference broke new ground in expanding the notion of theological “liberation” to imply a positive humanizing process, and attacking the political, social, and economic structures that kept millions of Latin Americans poor and oppressed. Recalling liberation theology’s rejection of the church’s traditional role as a bulwark of reaction and insistence instead on a “preferential option for the poor” takes on added importance given Jair Bolsonaro’s victory in last month’s presidential elections in Brazil. Appealing to the defense of “Christian civilization” as an ideological support for racism and class war from above, the president-elect echoes the rhetoric of the 1964–1985 military dictatorship — a regime he openly extols — along with the rationales advanced by figures like Jorge Rafael Videla and Augusto Pinochet for their mass murder of suspected dissidents across the continent. Betto’s activism was part of the broader trend within the Brazilian church, throwing its lot in with the country’s poor, oppressed, and despised, in parallel with social movements throughout Latin America that were catalyzed by the Medellín Conference. His trajectory also exemplifies the crucial point that liberation theology was very far from a rarefied and detached reconsideration of doctrine. Rather, its inextricable interconnection with grassroots movements for political and social justice facing obscene repression means that it is more apt to talk about “liberationist Christianity,” to borrow a term from Michael Löwy. Without reducing the complexity and variation of liberationist Christianity, Betto’s exchange was indicative of three common threads in this influential minority of the Latin American church. First, no longer tenable was a conception of faith or belief that stressed contemplative observation of rites and adherence to a body of doctrine and ritualistic practice. Rather, an alternative understanding was put forward, reconceiving the demands of faith as, first and foremost, commitment to the oppressed and suffering. Liberationist Christianity instead found in the Marxist dictum of solidarity with the oppressed in their self-emancipation an appropriate conceptualization of charity. Engagement with the Marxist concept of the proletariat was not, though, a reduction to it — contrary to critics of liberation theology within the church. The term “pooretariat” [pobretariado], coined by Christian Marxist trade union activists in El Salvador, neatly captures liberationist Christianity’s attempts to encompass the specific Latin American experience of dependent peripheral capitalism. This crucified poor, then, included not only exploited classes but also those excluded from the formal productive system, despised races and marginalized cultures and, as figures like Gustavo Gutiérrez have stressed, women as a doubly oppressed social category. to deny the reality of the class struggle means in practice taking a position in favor of the dominant social sectors. Neutrality on this question is impossible. [What is needed is] to eliminate the appropriation by a few of the surplus value produced by the work of the great majority, and not lyrical appeals in favor of social harmony. We need to build a socialist society which is more just, more free and more humane, and not a society of false conciliation and apparent equality. How did liberation theology come about and how has it manifested in political and social struggles? And what is its status today, particularly in view of the reactionary tide in Latin America and globally? “In a symbolic way,” Löwy suggests, “one might say that the radical Christian current was born in January 1959 at the moment when Fidel Castro, Che Guevara and their comrades marched into Havana, while in Rome John XXIII issued his first call for the convening of the [Vatican II] Council.” More broadly, this moment was characterized by the industrialization of Latin America under the hegemony of multinational capital and, in André Gunder Frank’s phrase, “developed underdevelopment” – the symptoms of which were greater dependency, deepened social division, rural exodus and a burgeoning impoverished and marginalized urban poor. In that context the Cuban Revolution sparked off a new cycle of intensified social struggles, the appearance of guerrilla movements, a succession of military coups and a crisis of legitimacy of the political system throughout the hemisphere. Given that the Latin American church was traditionally a bastion of support for that system, it was by no means expected that it would weigh in on the side of the emergent social struggles. That an influential minority did so can be traced to the emergence of critical theology in the early twentieth century and the opening up to the social sciences in the church’s attempted modernization by Vatican II. Particularly important were German theologians like Karl Rahner and their French counterparts like Emmanuel Mounier, who drew on French anti-capitalist thought. Heterodox trends within Marxism like Ernst Bloch’s philosophy of hope and the Frankfurt School also inspired liberation theologians, as did Marxist sociology and economics more broadly – both of which informed the declarations of the Medellín Conference. Crucially, though, liberation theology was not simply an extension to the Americas of European theological innovations or the reheating of longstanding conservative Catholic antipathy to capitalism. It involved the creation of a new religious culture expressing the specific conditions of Latin America: dependent capitalism, massive poverty, institutionalized violence, popular religiosity. It rejects Eurocentric conceptions of history that linger even in progressive thought, seeing optimistic visions of history as a story of progress and technological advance as hubris. Instead, it thinks history from the reverse viewpoint of the defeated and excluded, the poor as the bearers of universality and redemption. An iconic moment in the development of liberationist Christianity was the death of Camilo Torres, a priest who organized a militant popular movement and then joined the National Liberation Army (ELN), a Castroist guerrilla movement in Colombia, in 1965. For Torres, “the Revolution is not only permissible but obligatory for Christians.” He was killed in 1966 in a clash with the Army, but his martyrdom made a deep emotional and political impact on Latin American Christians. Radicalized priests organized throughout the continent — Priests for the Third World in Argentina in 1966, the National Organization for Social Integration (ONIS) in Peru in 1968, the Golcanda group in Colombia, also in 1968, Christians for Socialism in Allende’s Chile in 1971 — while a growing number of Christians became actively involved in popular struggles. They reinterpreted the Gospel in light of this practice and often saw in Marxism a key to the understanding of social reality and a guide to changing it. The Brazilian church is the only church on the continent where liberation theology and its pastoral followers won decisive influence, however. Many of the Brazilian popular movements that have made impressive gains for social justice over the last decades are to a significant extent the product of the grassroots activity of committed Christians, lay pastoral agents, and Christian base communities: the radical trade union confederation (CUT), the landless peasant movements (MST), the poor neighborhood associations — and their political expression, the Workers’ Party (PT). Given particularly close cultural ties with France, French progressive theology made quicker headway into Brazil than elsewhere in the hemisphere, and so was a readily available tool with which to make sense of the currents unleashed by the Cuban Revolution. Already by 1960 the Catholic student movement, the JUC, became radicalized and moved very quickly towards leftist and socialist ideas. The early 1960s saw the flowering of ideas about the specificities of the Brazilian situation in light of political and theological developments further afield. An important aspect of the development of liberationist Christianity in Brazil was popular education. Engaging with Paulo Freire’s revolutionary pedagogy, the Movement for Base Education (MEB) was the first Catholic attempt at a radical pastoral practice among the popular classes. MEB aimed not only to bring literacy to the poor, but to raise their consciousness and to help them take control of their own history. The sentiment was, however, not shared by many Christian activists and priests, many of whom were among the first victims of the red scare of the authorities. If the Christian left was initially broken by repression and marginalization, over the next few years, as opposition to the dictatorship increased in civil society, a growing number of Christians, even including a few bishops, began to side with the opposition. Some of them were radicalized and in 1967–68 a large group of Dominicans, including Frei Betto, resolved to support armed resistance and help clandestine movements such as the ALN (Action for National Liberation) — a guerrilla group founded by a former leader of the Brazilian Communist Party, Carlos Marighella — by hiding its members or helping some of them escape the country. Soon several of them would be imprisoned and tortured by the military, and the guerrilla movement destroyed. Oppression was ramped up against Christian activists, and their “subversion” brutally repressed with imprisonments, rapes, torture, and murder — particularly after the remaining civil liberties and juridical guarantees were curtailed in December 1968. Initially cautious in challenging this repression, the church as an institution changed tack in 1970 with the accession of the new bishop, Dom Paulo Evaristo Arns, well known for his commitment to the defense of human rights and his solidarity with the imprisoned religious activists. This was such a turnaround that during the 1970s, after the annihilation of the underground left, the church appeared to friends and foes alike as the primary opposition to the regime. It offered protection to human rights activists, labor movements, and peasant unions, and it took the regime to task for its violence, lawlessness, and suppression of democracy. Liberationist Christianity also took root in fertile soil in Central America, albeit much later than in Brazil. It was a vital component of the Sandinista struggle and 1979 revolution in Nicaragua. The overthrow of the US-backed Somoza dictatorship was the first revolution in modern times in which Christians — lay people and clergy — played an essential role, both at the grassroots and at leadership levels of the movement. Before the Medellín Conference, the Nicaraguan church was a traditionalist and socially conservative institution, which openly supported the ruling Somoza dynasty. In 1950, for example, its bishops issued a statement proclaiming that all authority derives from God and that Christians must therefore obey the established government. After the Medellín Conference, there was a much broader development of the base communities, premised on solidarity and class-conscious self-organization, which also drew on the important organizing efforts of European and US clergy and religious orders, including figures like Maura Clarke, who would be murdered by the El Salvador military in 1980. The base communities expanded numerically in the slums of Managua and in the countryside at the same time as they were increasingly radicalized. Grassroots organization and the radicalization of these communities led many members to become activists in or sympathizers with the Frente Sandinista de Liberacíon Nacional (FSLN). The Marxist guerrilla movement founded in the early 1960s by Carlos Fonseca and Tomás Borge combined the traditions of radical agrarian nationalism, Guevarist Marxism, and revolutionary Christianity. It eagerly received these young Christian radicals, in turn, without trying to impose any ideological conditions on them. The FSLN’s ranks also drew significant numbers from the burgeoning Catholic university movement, often via the Christian Revolutionary Movement. This is not to say that the church as a whole embraced the revolution. Schematically, one can point to hostility from the bishops, support from the religious orders, and the diocesan clergy divided between these two camps with the greater number supporting the bishops. Nonetheless, even the top brass of the Nicaraguan church became increasingly critical of the Somoza regime as it became mired in crisis by the 1970s. Still, as the Sandinista insurrection put paid to the dictatorship over the course of the insurrections of 1978–79, the flight of Somoza, and the Sandinistas’ victory in July 1979, the church authorities held out on supporting the FSLN, issuing a blanket condemnation of violence. Ignoring the advice of the prelates, however, many Christians, particularly young and poor people, actively took part in the Sandinista uprising. The areas where the struggle was most intensive, and the action best organized and effective, were precisely those where base communities and radical Christians had been active in the preceding years. Furthermore, many priests, religious (especially Capuchins and Jesuits), and nuns gave direct help to the Sandinistas, providing them with food, shelter, medicine, and ammunition. The historical novelty of the huge Christian contribution to the revolution was not lost on the Sandinista Front, which acknowledged in its Declaration on Religion in October 1980 that “Christians have been an integral part of our revolutionary history to a degree unprecedented in any other revolutionary movement of Latin America and possibly the world …. Our experience has shown that it is possible to be a believer and a committed revolutionary at the same time, and that there is no irreconcilable contradiction between the two.” This confidence was given practical confirmation by the participation of three priests in the Sandinista government. As in Nicaragua, it was only after the Medellín Conference that things started to move in the Salvadoran church. Under the influence of the new orientation adopted in 1968 by the Latin American bishops and of the first writings of liberation theology, a group of priests started missionary work among the poor peasants of the diocese of Aguilares in 1972–73. The central figure in this group was Father Rutilio Grande, a Salvadoran Jesuit who taught at the seminary of San Salvador but decided to leave the city to share the life of the rural poor. The priests’ missionary team (many of them Jesuits) lived among the peasants and initiated base communities premised on an understanding of God’s plan as a rejection of oppressive human relations. A core purpose of biblical instruction was to break what they considered to be the passivity of traditional peasant religion. Parishioners were told that instead of just “adoring” Jesus it was more important to follow his example and struggle against evil in the world. This involved self-organization to struggle against what they identified as social sin — above all, capitalist exploitation. They also promoted self-assurance among the peasants, generating the rise of a new leadership elected by the community. Prelate opposition to liberation theology was even more acute within the Salvadoran church than in Nicaragua. 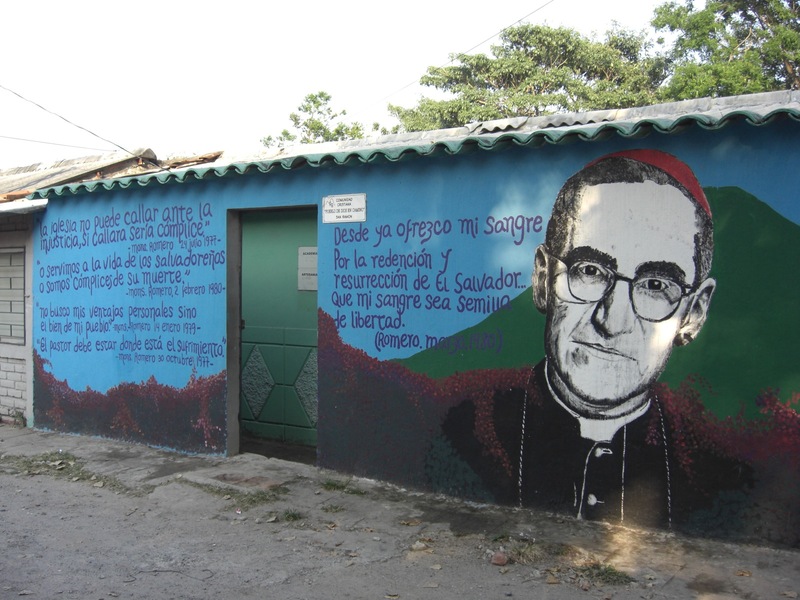 An important exception was Óscar Romero, who had been appointed Archbishop of San Salvador in 1977 as a safe conservative choice. Indeed, as he would later say to friends, he was chosen as the most likely to neutralize the “Marxist priests” and base communities, and improve relations between the church and the military government, which had deteriorated under his predecessor. Gillo Pontecorvo, director of the iconic movie The Battle of Algiers, once remarked that he hoped to make a film about Romero to explore his atypical conversion from conservative to radical. That turn was initially occasioned by the murder of Rutilio Grande, who had been a great friend to Romero on his arrival despite their different political orientations. After 1978 Romero became deeply influenced by the Spanish liberation theologian Jon Sobrino. He entered into growing conflict with the conservative bishops, the papal nuncio, the military, the oligarchy, and finally the pope himself. He met regularly with radical priests and the base communities, and later with trade unionists and BPR militants. His Sunday sermons were attended by thousands in the cathedral, while hundreds of thousands heard his message of the self-emancipation of the poor through church radio. In February 1980 Romero published his letter to President Jimmy Carter, imploring him not to provide military aid to the Salvadoran regime and not to interfere in the destiny of the Salvadoran people. A month later he made a special address to soldiers not to obey their superiors, reminding them that the peasants that they killed were their brothers and sisters, and they were no under no obligation to follow such orders. The next day he was himself killed by the paramilitary death squads. In his death he became a charismatic symbol for committed Christians in Latin America and beyond. Many commentators have pointed to a recession in the fortunes of liberation theology in recent years. One source of the backslide has been the rise of evangelical Christianity in Latin America on the back of massive aid from the US, particularly from the 1980s onward. With important exceptions, Latin American evangelism usually promotes apolitical religious practice, if not outright reaction and unctuous celebration of prosperity. It is, notably, a key base of Bolsonaro’s support. Nor was the rebel church untouched by the tide of triumphant liberalism from 1989, although it had not been associated with the rigidities and cruelties of Soviet-style communism. The defeat of the Sandinista government in elections the following year was, likewise, a huge blow to radical Christianity throughout Latin America. Interest has recently been regenerated, however, given the position of figures like Betto as advisor to imprisoned former Brazilian president Lula, and former Ecuadorian president Rafael Correa’s citation of liberation theology as fundamental to his own political formation. One of the most consistent obstacles to liberationist Christianity’s advance has been suspicion or outright hostility from the Vatican. So the accession of Pope Francis and his exhortations against the injustice of capitalism and canonization of Romero has naturally revived interest in the phenomenon, too. Against prognostications that it is a spent force, Löwy contends that “a seed has been sown by liberationist Christianity in the hotbed of Latin American political and religious culture, which will continue to grow and flourish in the coming decades, and still holds many surprises in store.” In redressing the depressed fortunes of the Pink Tide in Latin America, liberation theology — in its refusal of a consensual and unacceptable status quo, and patient and reflective militancy on the side of the downtrodden — has an important contribution still to make. At the very least, given the sordid record of the perpetration of monstrous injustices by the church, and the prevalence of Christian rhetoric in the service of neoliberal capitalism and the rampant inequalities, immiseration, and violence it generates, it is a tradition well worth remembering.